Non-enveloped, round, T=1 icosahedral symmetry, about 25 nm in diameter. The capsid consists of 12 pentagonal trumpet-shaped pentamers. Monopartite, circular, ssDNA genome of about 2300 bp. The genome is replicated through double-stranded intermediates. A replication Rep-like protein would initiates rolling circle replication. One mRNA is transcribed by cellular RNA polymerase II and encodes for three proteins: VP1, VP2 and VP3 probably through leaky scanning mechanism. Replication may be mediated by a Rep protein, and would occur by rolling circle replication producing ssDNA genomes. ASSOCIATED DISEASES Chicken infectious anemia. This disease is associated with depletion of cortical thymocytes and erythroblastoid cells. 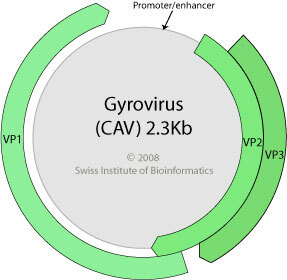 Chicken anemia virus VP3 protein induces apoptosis observed in CAV infection. Virus-induced apoptosis accounts for the severe depletion of cortical thymocytes and erythroblastoid cells in the bone marrow .